On May 2, 1890, the Organic Act for the Territory of Oklahoma provided the customary framework of a territorial government. Under the law's provisions, the president would appoint a governor, a secretary, three federal judges, and a marshal. Voters would choose members of a house of representatives and a council, as well as an official delegate to the U.S. Congress. Nebraska laws were to apply until the territorial legislature passed statutes. The Organic Act also divided the area of the Unassigned Lands into six counties, and the so-called No Man's Land (present Oklahoma Panhandle) became the seventh county. Lawmakers anticipated additional lands would be attached to the original territory after American Indians on various adjacent reservations received allotments and their surplus lands became available for settlement. Pres. Benjamin Harrison appointed George W. Steele of Indiana as the first governor of the territory. After arriving in late May and organizing his office, Steele scheduled the election of the legislature for August 5, 1890. Later that month, when the chosen representatives arrived at Guthrie, the designated capital, Republicans held a slight edge. The Democrats allied with the emergent People's Party (Populists), however, and recruited enough bolting Republicans to create a controlling coalition, which, surprisingly, elected a member of the minority Populists as presiding officer in each house. Preoccupied with location of prized institutions (the university, the capital, the agricultural college, and the normal school) the legislators neglected the passage of statutes until the waning days of the session. The stalemate and squabbling so disgusted Governor Steele that he resigned and returned to Indiana. The new territory grew dramatically, rising from 60,417 in 1890 to 722,441 in 1907, an increase attributable in part to the work of the Cherokee Commission, or Jerome Commission, as it was commonly known. Created by Congress under the same legislation that had opened the Unassigned Lands, the commission convinced the Cherokees to give up their Outlet and persuaded various other Indian tribes in central and western Oklahoma to take allotments. The federal government then opened the surplus acreage to non-Indians in four additional land rushes: in 1891 into the Sac and Fox, Iowa, and Potawatomi-Shawnee areas; in 1892 into the Cheyenne-Arapaho lands; in 1893 into the Outlet; and in 1895 into the Kickapoo Reservation. Unlike the original Unassigned Lands, settlers had to pay the government for their claims in these four subsequent land openings. In 1896 the U.S. Supreme Court concluded a dispute between Oklahoma Territory and Texas over "Greer County," organized by the Lone Star State. The court awarded the region to Oklahoma, and settlers who entered that area simply filed their claims under the Homestead Act of 1862. In 1901 federal officials held a lottery for free land, approximately thirteen thousand quarter sections of property once belonging to the Kiowa, Comanche, Plains Apache, Wichita, Caddo, and other affiliated tribes. Just before statehood the Territory of Oklahoma also added the Otoe-Missouri, Tonkawa, Kaw, and Osage reservations after virtually all of those lands were allotted to tribe members. New territorial citizens who arrived during the rapid expansion sought to secure their new homes and investments. They vied with each other for the multiplying normal schools, new county seats, and railroads for their communities. They faced a daunting struggle, especially during the economic depression and drought of the 1890s. Following the opening of the Unassigned Lands settlers in the four subsequent land openings often failed to make even the minimum payments owed to the federal land office. Hundreds of citizens in these areas soon formed the Free Home League to push for federal legislation to expunge their outstanding debt. Republican territorial delegate Dennis T. Flynn gained their gratitude when he persuaded Congress to pass the Free Homes Bill in 1900. National politics most directly affected the Territorial Era through the appointment of governors and other office holders. Only one Democrat, William C. Renfrow (1893–97), served as governor. Republicans held the presidency most of that period, resulting in the appointments of fellow Republicans Abraham J. Seay, 1892–93, Cassius M. Barnes, 1897–1901, William M. Jenkins, 1901, Thompson B. Ferguson, 1901–06, and Frank Frantz, 1906–07. Continuous control of the executive branch by the Republicans led to a predictable intraparty strife, most notably in 1901 during the controversy over the mental sanitarium at Norman under a contract with the territorial government. Several leading party members held shares in the company, and Pres. Theodore Roosevelt dismissed Governor Jenkins for his suspected role. This type of internal wrangling among the Republicans did their party little harm in the election of the delegate to congress. One lone Democrat-Populist served in that elected position: James Y. Callahan, 1897–99. Republicans otherwise monopolized the office: David A. Harvey, 1890–93, Dennis T. Flynn, 1893–97 and 1899–1903, and Bird S. McGuire, 1903–07. Despite the dominance of Republicans as governor and delegate, the two main parties had almost reached parity in the legislature by the end of the Territorial Era. Despite economic improvement, lingering problems frustrated many Oklahomans. The pressures of low commodity prices and high transportation rates angered many farmers during the era. They believed railroads unfairly controlled the market to the disadvantage of rural customers. The dramatic merger of large corporations at the turn of the twentieth century caused many territory residents to be fearful of "trusts" and monopolies. At the national level, beginning in 1902 muckrakers revealed corporate wrongdoing, and local newspapers began describing corruption and acts harmful to the people of the territory. As statehood approached, these concerns led the people of the Twin Territories (Oklahoma and Indian territories) to call for limiting corporations and enhancing the power of ordinary citizens. 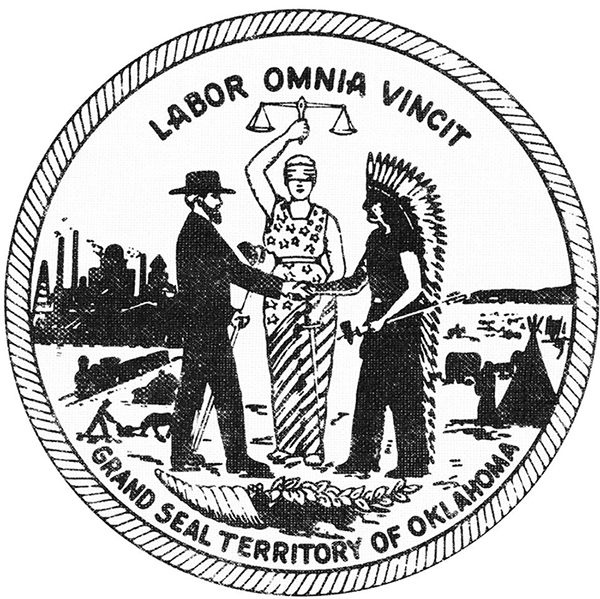 The newly formed Oklahoma Farmers' Union and labor interests in both territories joined to fight the special interests. Most of all, a large majority of the people of the Territory of Oklahoma simply wanted the creation of a state that would enable them to mold their future. The Oklahoma Enabling Act of 1906 allowed the writing of the constitution, and the territorial period officially ended on statehood day, November 16, 1907. John Alley, City Beginnings in Oklahoma Territory (Norman: University of Oklahoma Press, 1939). Mary Ann Blochowiak, "'Justice is our Battle Cry': The Territorial Free Home League," The Chronicles of Oklahoma 62 (Spring 1984). George O. Carney, "Oklahoma's Territorial Delegates and Progressivism, 1901–1907," The Chronicles of Oklahoma 52 (Spring 1974). LeRoy H. Fischer, ed., Oklahoma's Governors, 1890–1907: The Territorial Years (Oklahoma City: Oklahoma Historical Society, 1975). William T. Hagan, Taking Indian Lands: The Cherokee (Jerome) Commission, 1889–1893 (Norman: University of Oklahoma Press, 2003). Roy M. Gittinger, The Formation of the State of Oklahoma: 1803–1906 (Norman: University of Oklahoma Press, 1939). Danney Goble, Progressive Oklahoma: The Making of a New Kind of State (Norman: University of Oklahoma Press, 1980). Worth Robert Miller, Oklahoma Populism: A History of the People's Party in the Oklahoma Territory (Norman: University of Oklahoma Press, 1987). Dora Ann Stewart, The Government and Development of Oklahoma Territory (Oklahoma City: Harlow Publishing Co., 1933). Kenny L. Brown, "Oklahoma Territory," The Encyclopedia of Oklahoma History and Culture, https://www.okhistory.org/publications/enc/entry.php?entry=OK085.